I Mr. Ashok Manwani & my wife Mrs. Kulanjan Dubey Manwani, firm INDIAN PEARL CULTURE, both are engaged in doing pearl farming since 15 years. We are the only farmers who have done design Pearl Culture (farming) in states like Thane (Maharashtra), Bharuch (Gujarat), Bangalore (Karnataka), Begusarai (Bihar), Chitrakoot (Madhya Pradesh), Allahabad ( Uttar Pradesh), & Raipur (Chhattishgarh). We made the technique easy & simple so that farmers can easily adopt that & can increase/earn their livelihood. 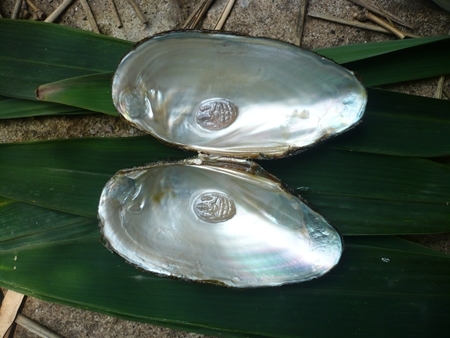 Doing fish farming along with Pearl Farming increases the production of mussels. We all know that Pearls are grown in sea water but in every village there is river, Pond, etc where we find mussels in which the farmers can do Pearl farming or can make handicrafts from the dead animals & can bring a new revolution not only for self but also for his village. The biggest profit/income for the village is that one mussel filters 40 liter water in a day which means the water will be cleaned automatically & our environment will also be safe. But our farmers are finishing mussles in ignorance as for them it is of no use. Buddha, etc are easy & comes early in production. We tried breeding mussels in Gujarat & Bihar on our own without any training from anywhere and we got successful results. 1) Innovative award by Central Institute of Fresh water Aquaculture in Bhubaneswar 2011. 3) Best innovative farmer of the year award by Central Institute of Fisheries Education in Mumbai 2013. 4) Best innovative Fresh water Pearl culture farmer award BIOVED 2015. 1) Awareness on Design Pearl culture of 30 cities in the exhibitions & at different places invited without any government fund/aid. 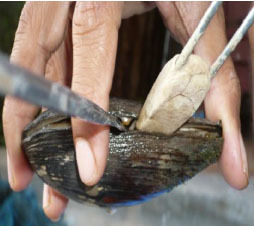 2) Simple tools like mussel opener and wooden mussel stand for operating the mussels. 3) We started developing quality beads/nucleus in our country instead of importing from the foreign countries. 4) Use of dead mussels to make Eco-friendly shinning handicrafts like Diya, Agarbatti Stand, Mobile stand, show pieces which is totally surprise to see. 5) Pearl farming to the farmer's house according to his comfort. 6) Integrated pearl farming & its value addition. 7) Giving importance to mussels farming as it filters water and are also called as filter feeders in science. 8) Seven pearl projects in India. We took the initiative to start Pearl Culture in easy way for the farmers. We used different techniques, also tried different ways & were failure for 10 years, but still went on working without any governmental help. We went in changing things, went to different states, lived in the jungles & did practical on different species and we are enjoying our work a lot. We want each and every person who is interested in pearl farming to come along and joint hands to reach the heights.